Destination: Baked and Wired Washington, D.C. Oct. 4. Distance: 11.8 miles. See our route here. Company: Mary for coffee and cake. Ted for a lap around Hains Point. A kingfisher bird. Bike Friendly? Not really. There’s a lone rack across the street. We usually lock to the fence along the C&O Canal Lock nearby. A few outside tables and chairs let you watch your bike, but they are usually occupied. Observation: The espresso here is high-quality. Mary got a gourmet hot chocolate. This is one of our favorite coffee stops — we always go there when we come into D.C. from the C&O Canal Trail or Capital Crescent Trail. Don’t let the line scare you off if you’re just having coffee. Sunday was another dreary day in D.C., though warmer than Saturday, and the rain stopped. Mary and I finally got ourselves out the door in the afternoon, mostly to get some fresh air, and to snag another coffeeneuring outing. I’d like to get 14 coffeeneuring rides in seven weeks — the unofficial perfect season — so this would complete the first weekend. See the line back there? The many, many social media postings from the coffeeneurs around the country and overseas also gave us a lot of motivation. Twitter and Instagram have been so busy with all the updates. 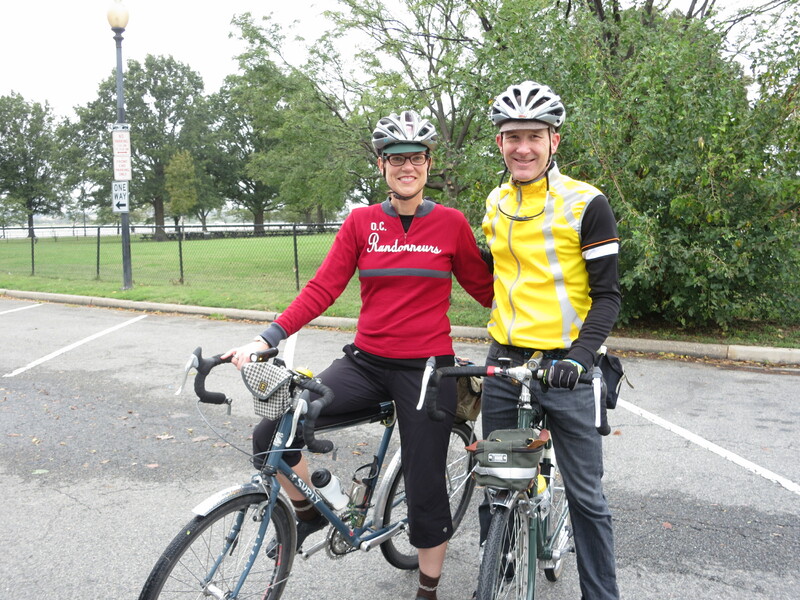 We rode our single bikes around the Jefferson Memorial, past the few tour buses and Segway riders, who were sightseeing regardless of the heavy clouds and blustery fall wind. Instead of riding north to the many hip coffee spots in the city center, we decided to go to one of our favorites over in Georgetown — Baked and Wired. They are known for their gourmet cupcakes, and have a line out the door on weekend afternoons to prove it. The coffee side of Baked and Wired. But they also have a high-end coffee bar on the other side of the shop with its own much shorter line. They also sell some baked goods on the coffee side. Hot chocolate on a cool day. Today we got a soy cappuccino for me and a hot chocolate for Mary. We also got a rare empty table outside, where we enjoyed our drinks and a fabulous piece of mandarin orange coffee cake. 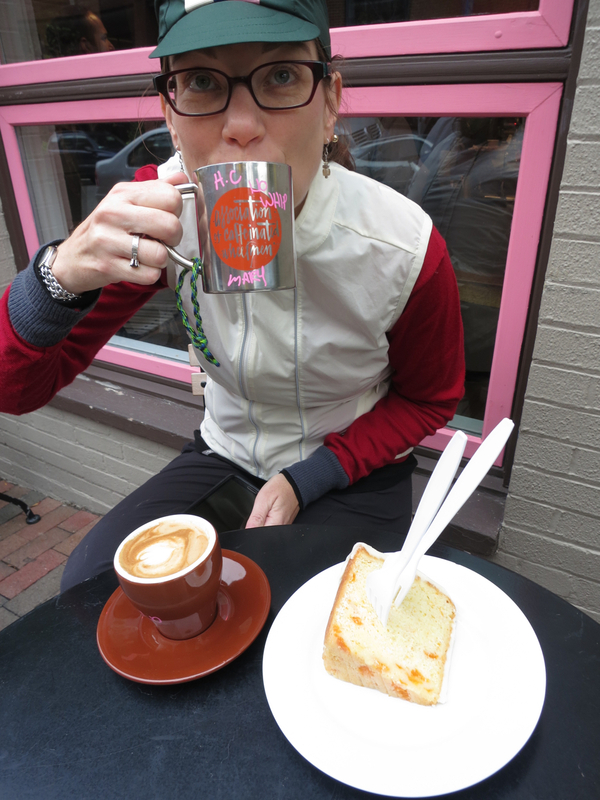 If there is a theme to our 2015 coffeeneuring so far, cake has been a part of both outings so far, so there you go. Mary and Ted, on Hains Point. We rode back towards the Jefferson Monument, and decided to go see how much of Hains Point was underwater from all the rain. Our Friday Coffee Club pal Ted N. was out on his Surly and we rode a lap at conversational pace. The flooding had receded, so no swamps to report, but Ted pointed out a kingfisher bird that was hunting along the water. That was pretty cool.